Building Performance Consulting offers HERS Ratings in the Atlanta, Georgia metro region. Recognized by many as the industry standard by which one can measure a home’s energy efficiency, a Rating produces a numerical score which can be used to compare one home to another. A lower number represents lower energy consumption. Each point represents 1%. A HERS Rating assigns a home a score on a 150-point scale. A standard new home meeting Georgia’s Energy Code would score in the 80s; existing homes often score over 100. A Rating is a requirement for many green building and energy efficient building standards and can be seen as a miles-per-gallon equivalent for new homes. Even for a home that won’t be certified in a green program, the process of creating a HERS Rating can identify the most cost-effective options in what is often a complex homebuilding process. 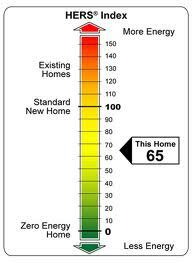 A HERS Rating is a requirement for an Energy Efficient Mortgage (EEM) and/or an Energy Improvement Mortgage (EIM). Further, it can be a great way for builders to set their homes apart in a crowded real estate market – a good HERS index is an objective, measured representation of a home’s energy efficiency. For more information about HERS Ratings, or to schedule a free phone consultation, contact Building Performance Consulting.